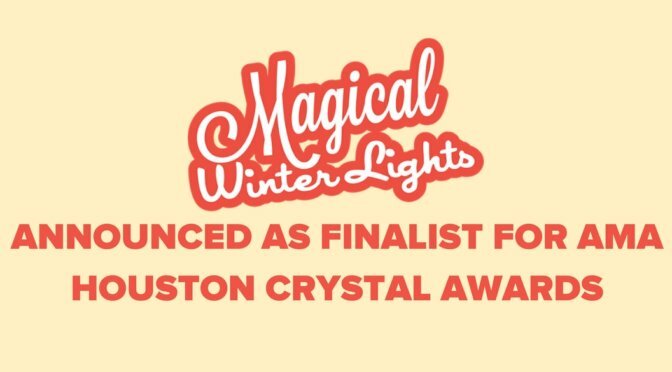 The Magical Winter Lights team, People Generation, became finalists of AMA Houston Chapter’s Crystal Awards in three categories on April 11, 2018. We are so excited to be continuously recognized by AMA, and look forward to be winning the awards at the gala on May 10, 2018! MWL currently holds the title for the 2015 and 2016 winner of AMA Houston Crystal Award Event Promotion – Single Event. Magical Winter Lights (MWL) is a spectacular, larger-than-life festival that presents a fresh multicultural take on traditional holiday light shows. This 50-day holiday celebration occupies 20 acres of outdoor space, featuring Texas-sized lantern masterpieces using Chinese lantern-making techniques, some of which are 60-foot high. We have succeeded in becoming Houston’s largest holiday celebration and the nation’s largest lantern festival of its kind. People Generation, a global communications firm, is distinctly positioned to cultivate international experiences. The company utilizes an interpersonal approach to transform international cultures unique to the American audience through large festivals, expos, performances, and traditions. It is the 2015 and 2016 winner of AMA Houston Crystal Award: Single Event Promotion – Public Sector. Each spring, AMA Houston hands out almost 100 Crystal Awards to Texas’ best and brightest marketers. The Crystal Awards gala is the largest marketing event in Houston and is attended by more than 650 marketing professionals from almost every industry.